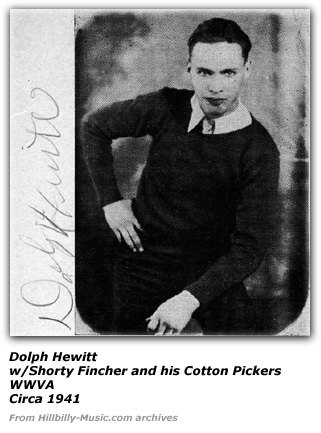 Adolph (Dolph) Edward Hewitt was born in Washington County, near West Alexander (a 1950 article notes it was near West Finley) in the hills of Southwest Pennsylvania to John Nicholas Hewitt and Lulu Zelphia Petit Hewitt in a saw mill which had been converted into a house. A short biography in a 1957 magazine says it was an area known as Snuff Hollow, between West Findley and Nebo. Dolph was the eldest of nine children in the family. Dolph spent most of his childhood years on a rented property which was known in the area as �The Old Carol Place.�It was a humble two room house with a small lean-to�side shed. In the summer, the Hewitt boys would convert the side shed into a bedroom by covering the cracks and gaps in the wood plank walls with comics they had collected from newspapers; this kept the mosquitoes out. He grew up working in the fields harvesting crops in and around Washington County with his father and his brothers at a time that our nation's economy started to slip into depression. More often than not, an entire day's pay for their labor for the entire family might be as much as a sack of flour or as little as just something to eat. Dolph's father was a farmer and also an old-time fiddler. Dolph first got exposed to music at the old square dances. He learned to sing while working in the fields as well as clearing timber. However, it appears he began to break with family tradition and also learned to play the guitar. His musical journey took a detour from his fiddle playing during one square dance when he was sitting on the floor playing the fiddle and his little brother Fred began dancing. Dolph decided to reach over and give his brother a whack on the head with the bow, but in doing so, broke the bow. And he had to give up fiddle playing until he was able to replace the bow. Dolph told Jovida Fletcher in an 1996 interview for the Orlando Sentinel that while growing up, the Hewitt family lived in 15 different houses by the time he was 16. He mused, they moved so often he never got to know anyone very well. Playing the fiddle became a way to pass the time. Dolph never had any formal musical training and later learned the guitar and mandolin. He formed a quartet with three of his brothers and they practiced their harmony after the farm chores were done. Their first appearance was over radio station WNBO in Washington, Pennsylvania where they won an amateur contest. That led to a program on the same station airing twice a week. However, that was a non-paying appearance for the "experience". If the family had meat at their table, it was provided by their hunting the hillside for ground hogs, squirrels, rabbits and if you were having a really good day, wild turkey. But the problem with this approach was that every other family was doing the same thing. Your hunting skills had to be good to be successful. In 1930, tragedy struck the Hewitt family when their father, John Hewitt died. Dolph was the eldest in the family and only 16 years old but he was now responsible for supporting his mother and eight brothers and sisters. He soon realized that it was not going to be possible to support his family working in Washington County in the middle of the �Great Depression.� Dolph made the decision to pack his belongings and move to Wheeling, West Virginia to try to make a living using the one other talent he had, playing the fiddle. Once he got to Wheeling, Dolph auditioned for WWVA and landed a job with the station. There were no records or recordings at that time; all music was performed live. Dolph began working with Frankie More and his Log Cabin Gang and would often play ten shows a day and then drive off into the evening and play a personal appearance. The work was hard but it provided enough money to help his mom and family survive. He stayed with The Log Cabin Gang for about ten months. He joined Shorty Fincher's Prairie Pals. In an old souvenir booklet, Dolph told the readers and fans his hobbies then were hunting, fishing and horseback riding. And he hoped he could go on entertaining the audiences for a long time. 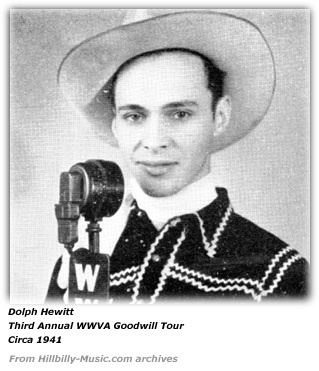 Over the next several years Dolph worked at other radio stations across West Virginia and the upper Midwest. Dolph�s siblings were on their own by this time and Dolph had entered into his first marriage with Margarette Post. Four of Dolph�s five children came from this marriage. Dolph and Margarette had three daughters; Emma, Betty and Shirley and along with one son, Frank. The marriage ended in divorce with Dolph receiving custody of his children. Dolph had a dilemma being a single parent and a musician, so he enlisted the help of his mother and had asked her to be the legal guardian of the children while Dolph did the only thing he could do to support them, play the guitar and sing. Dolph supported and visited the children and his mother as often as his schedule would allow. 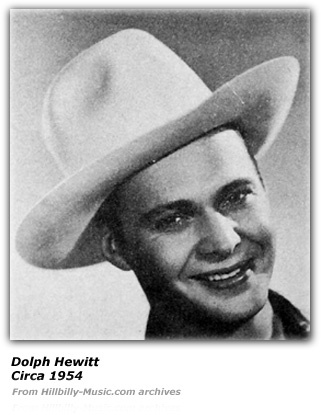 The early 1940�s saw Dolph in St. Louis at radio station KMOX. He had developed a good following in his career and as a result landed a job on the ABC Radio Network as part of the Pappy Cheshire�s Ozark Champions. Dolph became known as much for his singing and guitar playing as he did for playing the fiddle. It was while in St Louis that Dolph met his wife-to-be, singer Ruth Johnson of the Johnson Sisters. World War II War interrupted their wedding plans. Dolph joined the Marine Corp and served with the Fifth Marine Division in the South Pacific for 26 months until the war ended. During some of the bitterest fighting Dolph witnessed the raising of the American flag at Iwo Jima in Japan. After one particular battle, one of Dolph�s commanding officers asked him how he got to be such a good shot with the rifle. Dolph recalled his early life experiences and replied by asking his commander whether his father had ever handed him a .22 caliber rifle and one shell and told him to go out and get dinner for a family of 11. �Ya kinda learn not to miss.� The commander just shook his head �no� and laughed. Dolph was also known by his fellow Marines for performing and entertaining them whenever he could. We later discover that his commanding officer was Lt. General Holland (Howlin' Mad) Smith who gave Dolph a standing invitation to "...come up and sing and play anytime." The great war finally ended and Dolph returned stateside, to St. Louis and met up again with the woman he loved. Ruth and Dolph were married shortly thereafter. The wedding took place in Cleveland, Ohio at the �Old Stone Church in the Square� on December 13th, 1945. Their son "Chuckie" was born in St. Louis while he was performing with the WLS Sage Riders in the Prairie Farmer tent at the Wisconsin State Fair. Needless to say, they did without him after that as he drove to St. Louis where his wife and new-born son were at the time. Ruth's sister was married to Jimmy Hutchinson. 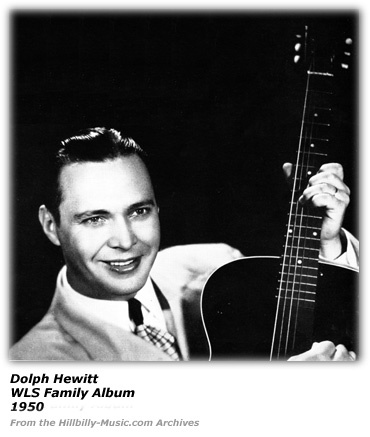 While in Chicago, Dolph recorded on the RCA Victor label, KAPP Records, and Hill Records. His first recording, "I Wish I Knew"�was so successful that Dolph was able to purchase a home in Lombard, Illinois, a suburb of Chicago. 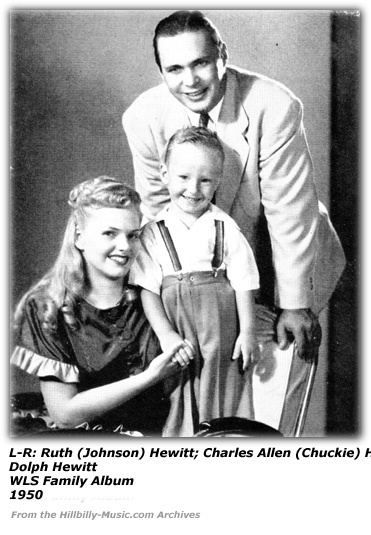 Dolph and Ruth lived there for fourteen years and raised their son Charles Allen (Chuck) Hewitt. WLS was a clear channel station broadcasting with a 50,000 watt signal. WLS could be received and heard across most of America. 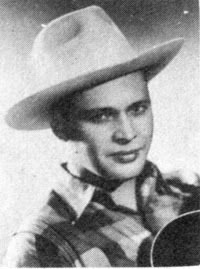 Arlie Kinkade informed readers in 1949 that Dolph's single was doing great. And also noted that Dolph was doing a tune that Arlie had a hand in writing with Pearl Mullins, "Father Til He's Gone". A later article notes Dolph's style on the recording. "Dolph strikes an appealing note with his rich and resonant tone of voice, singing with a warmth and tenderness which comes over beautifully on wax. The string band accompaniment supplements his roma(n)tic warbling." Buddy Starcher told readers of his fan club newsletter in 1949 that Dolph's two-year old son was starting to show signs of being a budding entertainer himself and upstaging dad's own yodeling talents. Buddy noted he knew Dolph from the time they worked together at WMMN in Fairmount, West Virginia. The WLS National Barn Dance enjoyed no small amount of popularity. We found an example in a 1955 article by Don Doty about goings on in the Midwest. On October 7, 1954, Dolph, Lulu Belle and Scotty, Captain Stubby and the Buccaneers, Woody Mercer and the Beaver Valley Sweethearts played before 100,000 people at the Miles Martin Farm located near Camden, Indiana as part of the WLS Farm Progress Show. Dolph's recognition reached new heights which meant it made it nearly impossible to travel through any town in the range of the WLS signal without being recognized. 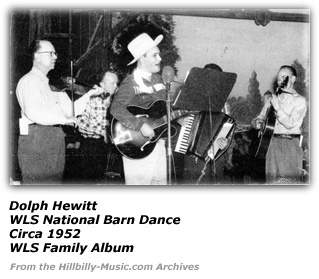 While at WLS Dolph performed on a number of programs that were broadcast throughout the day in addition to the The National Barn Dance on Saturday night.�One program was "Smile-A-While"� with WLS announcer Bill Duane. The times were changing however. In 1960, WLS was sold to the ABC Radio Network and much to everyone�s surprise; the Barn Dance was replaced by something new, Disc Jockeys playing records. 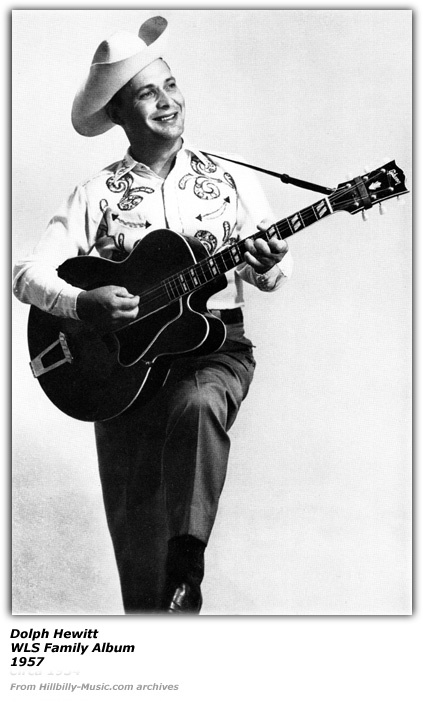 In June of 1961, The Billboard was reporting that the Janie Recording COmpany had just signed him to a recording contract. The label also had fellow WGN Barn Dance members Bob Atcher and Red Blanchard set for recording sessions. Along with the move to WGN, Dolph realized that he needed a stage band and organized the new �Sage Riders� which consisted of; James (Jimmy) �Juice� Hutchinson on Lead Guitar; Tiny Murphy playing steel guitar; Toby Nix on Bass Fiddle; Lino Frego playing the accordion; and Johnny Frego on violin/fiddle. In addition to being the Barn Dance Stage Band during this time, the Sage Riders accompanied Dolph on all of his personal appearances. The advent of the 1969-1970 television season saw WGN canceling the Barn Dance. In that 1996 interview, we learned that Dolph had developed an inner ear problem. His doctor suggested he move south. Dolph's attorney knew George Beauchamp, who developed the Kissimmee Orange Gardens. It was Beauchamp who sold Dolph and Ruth on the idea of moving to Florida when they met. The Hewitts bought a home in the Orange Gardens area, then returned to Chicago and within 30 days, sold an apartment home and two radio stations. As Dolph was quoted, "We did that in a real short time and never were sorry." In 1971 Dolph and Ruth moved to Kissimmee, Florida and purchased 160 acres of land on Highway 192 near Disney World where Camping World now stands. Dolph had a dream to build a five thousand seat auditorium that would feature live country music shows. That dream however was interrupted by a period of ill health which forced him to reconsider that effort. Howard Hughes was involved with the financing of the deal, but before the deal was complete, Dolph sold the land. Dolph began working at radio station WFIV in Clermont, Florida. His wife Ruth joined him on the station later. Dolph also formed the Florida and Georgia Radio Network. Dolph never lost his love of music and the desire to entertain, whether it be for an audience of one or 5,000. He hosted a jam session at his home every Wednesday or Thursday evening. Adolph �Dolph� Edward Hewitt passed away in 1996 in Kissimmee, Florida at the age of 82. Dolph�s final resting place is modestly marked in Osceola Memory Gardens, Kissimmee, Florida next to his beloved wife, Ruth Johnson Hewitt and the son they shared, Charles Allen. His wife was Ruth Johnson, one of the Johnson sisters who used to be on the radio. One of her sisters was a "Hormel Girl". And another sister was married to Jimmy Hutchinson of the Sage Riders. Hillbilly-Music.com would like to express its appreciation to Richard Daniels and the Hewitt family for providing information about Dolph's career.